Since I moved to Devon, one of the best things I’ve done has been to join Mid Devon CC. I’ve never been a member of a cycling club before, and like many of people, I wrongly assumed it wasn’t for me. But it was! Being located in one of the hilliest areas of the UK, Mid Devon CC is not without it’s share of seriously fast, incredibly strong riders, but they have a whole load of different ‘club runs’ operating every Sunday, so there’s something for most levels of rider. Over the last year, the club (and Michele Radant in particular) made a huge effort to recruit more female members, and to offer rides that will suit newcomers to the sport. The ‘social ride,’ runs in conjunction with Breeze every Sunday, and now actually often sees one of the biggest turn outs. It’s really nice to see a cycling club that’s making an effort to be inclusive and make people feel welcome. Myself and Dave Noakes recently did the first part of our British Cycling coaching training, so I’m delighted to now be in a position to pass on some of the knowledge I’ve gained over my many years of cycling. If you’ve read this blog before, or know anything at all about me, you’ll know that I’m passionate about getting women involved in sport and cycling, so the first course we’ll be offering is for the ladies only. As we’re both members of Mid Devon CC, this course will be run in conjunction with the club, thereby helping women transition from the Breeze rides onto the other club runs, or to simply gain confidence and get more out of cycling. 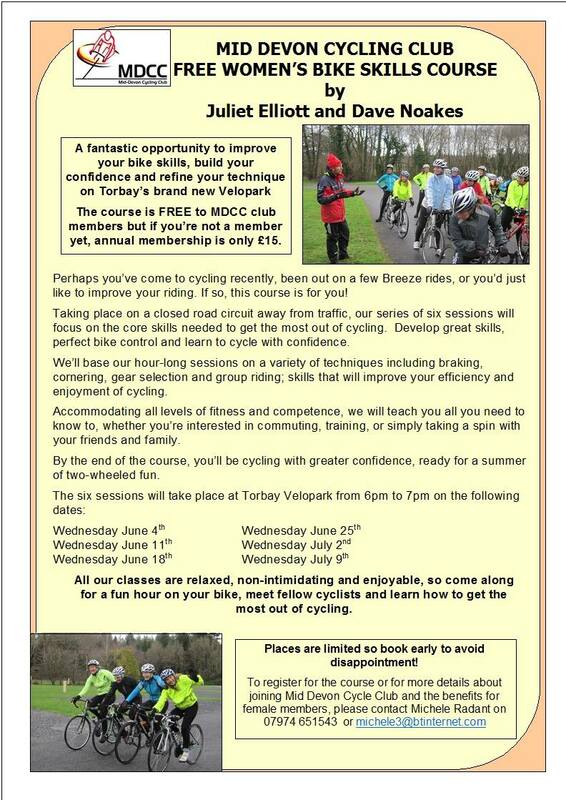 The series of six sessions will take place at Torbay’s new velopark and will present the perfect opportunity to improve your bike skills, build your confidence and refine your technique. The course is FREE to members of Mid Devon CC, or £18 to non-members. Perhaps you’ve come to cycling recently, been out on a few Breeze rides, or you’d just like to improve your riding. If so, this course is for you. Taking place on a closed road circuit away from traffic, our series of six sessions will focus on the core skills needed to get the most out of riding your bike. Develop great skills, perfect bike control and learn to cycle with confidence. All our classes will be non-intimidating and enjoyable, so come along for a fun hour on your bike, meet fellow cyclists and learn how to get the most out of cycling. We’ll base our hour-long sessions on a variety of techniques including braking, cornering, gear selection and riding with other people; skills that will improve your efficiency and enjoyment of cycling. Accommodating all levels of fitness and competence, we will teach you all you need to know to, whether you’re interested in commuting, training, joining a cycle club, or simply taking a spin with your friends and family. By the end of the course, you’ll be cycling with greater confidence, ready for a summer of two-wheeled fun.